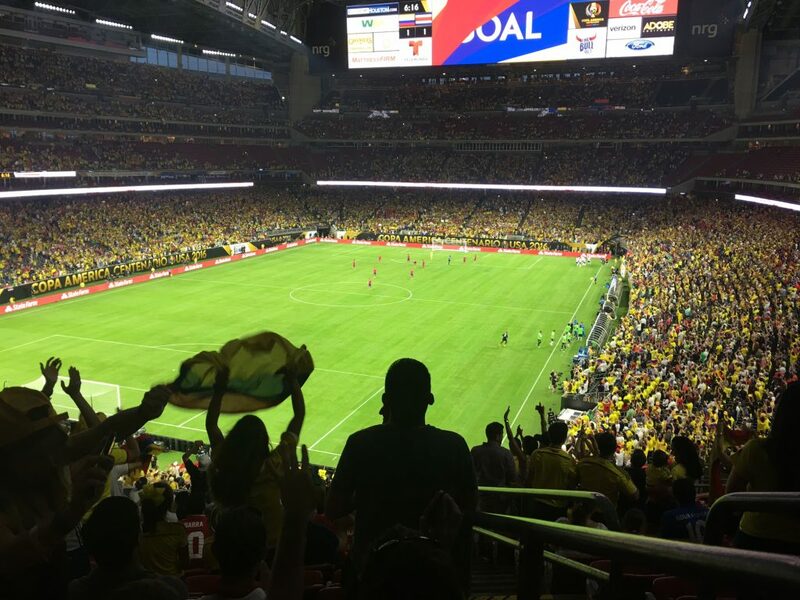 We made our way to Houston on Saturday to attend the final Group A match of the 2016 Copa America Centenario between Colombia and Costa Rica. We arrived early enough and found one of the thousands of televisions at NRG Stadium to nervously watch the tight finish pulled off by the USMNT. When we decided to travel to Houston it was not just for a soccer match, there was also the experience of watching two foreign countries’ supporters compete on a neutral ground. Groups of fans donned their country’s jerseys, traditional garments, and hats. Many brought flags to wave with excitement, or at other times, serve as a blanket to bring comfort when the match wasn’t going their way. Even following the result from the USMNT, there did not seem to be much riding on this final Group A game, as heavily-favored Colombia had punched their ticket to the next round, and with a win or draw they would win the group. But Costa Rica had other intentions when Johan Venegas found the net in the 2nd minute. Although Los Cafeteros were able to score the equalizer just 5 minutes later, they would spend the majority of the match chasing a result. Of the 45,808 in attendance the Colombian supporters must have outnumbered the supporters of Los Ticos 4 to 1, yet is was Costa Rica’s party. With nothing to gain except respect, and without a goal to that point in the tournament, they were ready to send a message. On the night, Costa Rica netted 3 goals (including an own goal) and defeated James Rodriquez’ Columbia 3-2, sending a shock wave through the tournament. With the two results from Saturday night, the US won Group A and earned a match against Group B runner-up Ecuador. Colombia placed second in the group and will take on surprise Group B winner Peru, who handed Brazil a loss in dramatic fashion on Sunday night. Without looking too far ahead, if the USMNT are able to get past Ecuador on June 16th, their path brings them to this very same NRG Stadium, and potentially, a date with Leo Messi’s Argentina. Next Can Dempsey Lead the Yanks Past Argentina?